I’ve been following PaletteMeli on Instagram for a while now, and I always love her adorable pastel designs! 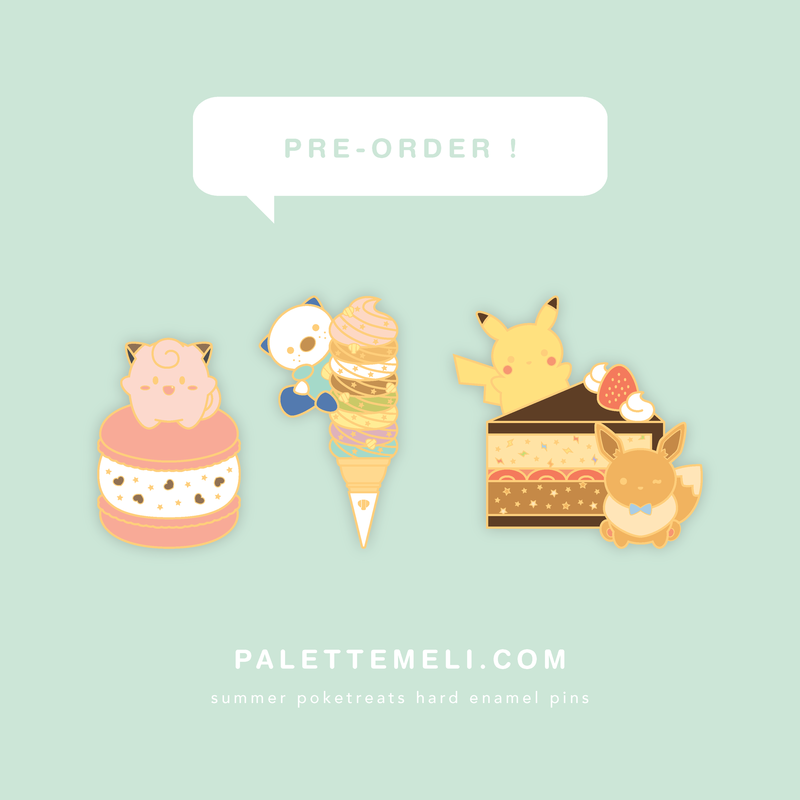 Which is why when I heard that she had opened preorders for a new Pokétreat pin series and extended the deadline when the preorder goal hadn’t been met, I knew I had to share it to help spread the word! Who doesn’t love Splatoon? Nintendo’s new fun, fast-paced, and drop-dead adorable IP has stolen many a heart over the last few months, and it’s not hard to see why. When I’m not jumping online for a quick match in Turf Wars, I’m humming my favorite songs and dreaming I’m half as fresh as the inklings inhabiting the world of Splatoon. 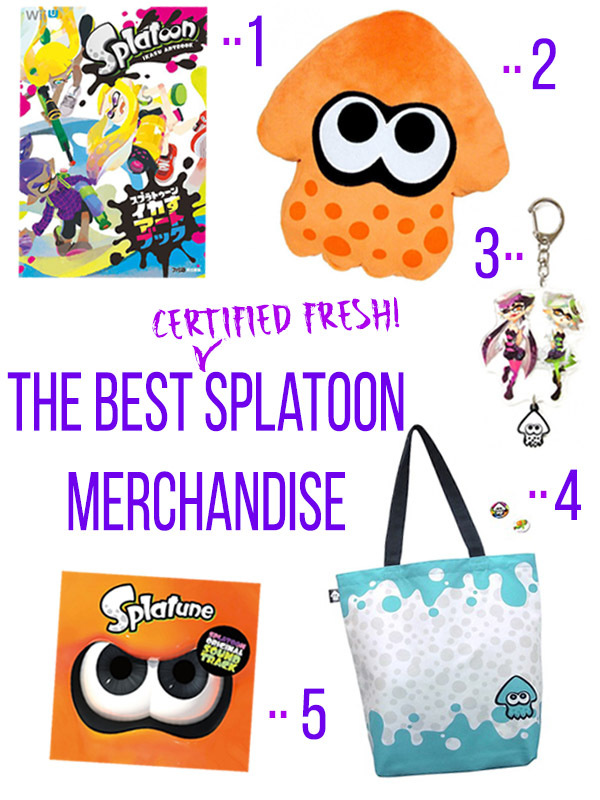 If you’re like me and can’t get enough of this amazing title, here are five items you need to put on your wishlist immediately! Welcome to Apricotsushi Shops, a new series where I highlight cool Japanese products I’ve found in my travels and the all items I’m currently pining over on my wishlist! Sometimes I’ll focus on a specific theme, and sometimes I’ll share whatever I can’t get off my mind, but one thing’s for sure… You’ll want to hold onto that wallet! I think I have a Sailor Moon problem. I’m not even watching the new anime, Sailor Moon Crystal, but I can’t stop looking at Sailor Moon merchandise! For someone who grew up with the series, the recent revival is everything amazing you didn’t get when you were a kid (well, if you were a kid like me living in the middle of nowhere, USA). 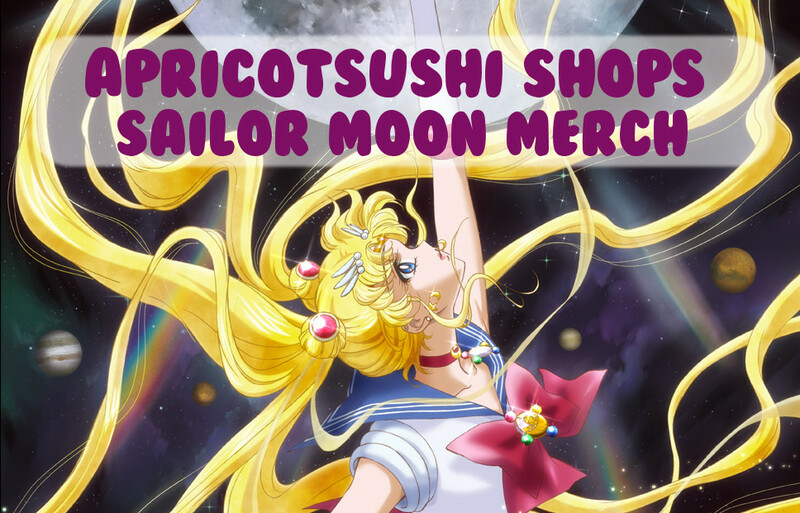 But, not all Sailor Moon merchandise is created equal. Today, I’m going to show you the cream of the crop! I buy a lot of stuff. When I moved last month, I became acutely aware of exactly how much stuff, and while it’s not exactly more than I initially thought, you get a whole new kind of appreciation for the paraphernalia you’ve amassed when you move from one tiny apartment to another. There are lots of things I purchase that would be relevant to this site that I never get around to covering (usually due to time constraints, admittedly), so I thought it might be fun to start a monthly unboxing series where I show off some of the goodies I’ve picked up. Then, if you want to see a video or feature about a particular item I picked up, you can leave a comment or message me on Twitter to let me know. That way, I know there’s interest so I can make sure to allot time to do a feature or video on it! Should I change the cover image to something else so my “haul” items are a surprise? Do I blab on about nothing for too long? Any and all feedback is greatly appreciated, so do please let me know what you think! In honor of the recent announcement that Touch Detective 3 will be coming to Nintendo 3DS sometime this year, I thought now would be as good a time as any to talk about more Funghi merchandise. Honestly, I never thought I’d say I’m a fan of Funghi, but I do think the phallic little mushroom is warming on me! There’s something charming about his lack of cuteness, I suppose, or perhaps I’m just morbidly fascinated by the fact that he’s so darn popular in Japan right now. 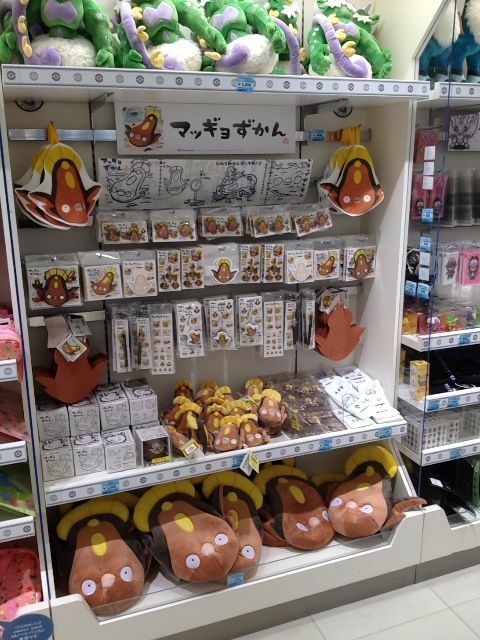 Just like Hello Kitty or Rilakkuma, Funghi, or Nameko, as he’s known in Japan, has spawned numerous lines of stationary and other goods, mobile games, and even a puzzle game for the 3DS! 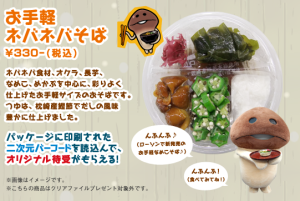 Anyway, the latest Funghi-related goodness comes from the convenience store chain Lawson, which will be stocking special Funghi food products from the 6th to the 17th of June. The campaign just happens to occur when I’m in Japan, so you can bet your cartridges that I’ll be seeking out a Lawson shop to try them out! The first tasty treat in the series is Funghi-branded Tirol candies. I don’t believe I’ve actually had a Tirol chocolate square before, but I can tell you I’m already getting hungry looking at some of the delicious flavors shown on their website! The two Funghi flavors are mitarashi dango (a traditional Japanese desert that consists of three glutenous rice balls on a skewer, covered in sweet soy sauce) and strawberry. I think it’s safe to say I’ll go the mitarashi dango route, though the strawberry Funghi is pretty adorable! Next up is the “neba neba” Funghi soba, which of course consists of a number of toppings including okra, seaweed, and some of Funghi’s nameko mushroom brethren. Try not to imagine you’re eating poor little Funghis when you dig in! “Neba neba,” by the way, means “sticky,” or “gooey,” which probably is an accurate description of what eating the above soba dish would be like. For a great writeup on “neba neba,” go here! Finally, anyone who purchases two of the Funghi food products at once (you could get two Funghi neba neba sobas, but should you?) 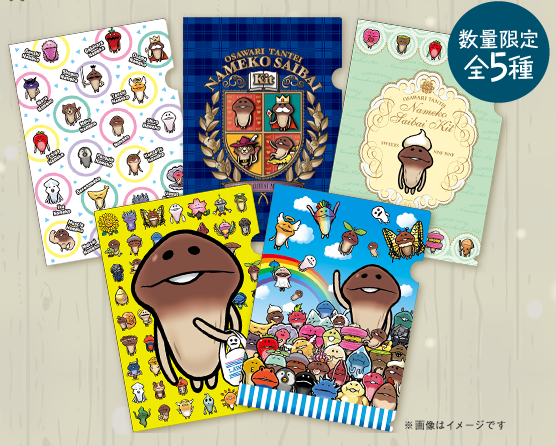 will get one of five exclusive Funghi x Lawson clear file folders. I have to admit, I’d probably make all sorts of weird food purchases if it meant obtaining limited-edition goods. 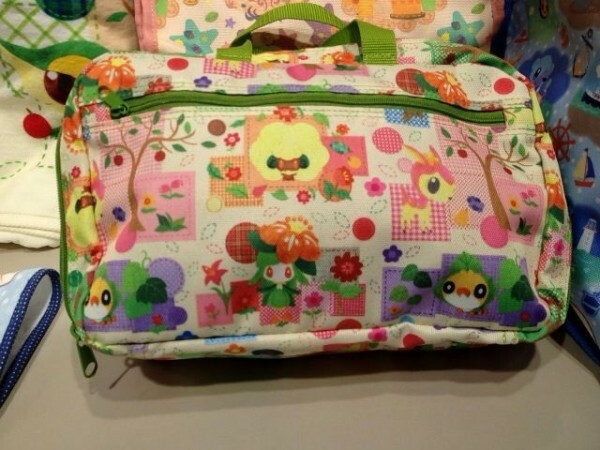 I’m particularly partial to the yellow folder on the bottom left – I love all the different Funghi characters in the background and the fact that the Funghi in the foreground is carrying a Lawson bag! 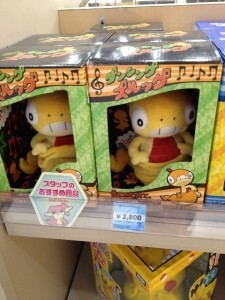 Well, I know what I’m adding to my list of things to do in Japan! 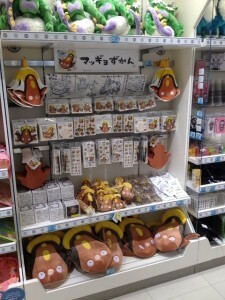 If you’re at all familiar with this blog, you know that I’m not a stranger to posting about Japanese Pokémon merchandise. So what more could I possibly have to say about the topic? Prepare to be amazed. Recently I stumbled on to what might be the best Pokémon-related website ever, Pokémon Tokyo. What is it, exactly? 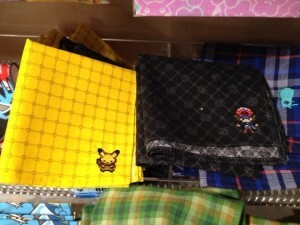 Oh, you know, just some pictures of Pokémon merchandise the author finds in Tokyo. Except they post virtually every day. Sometimes multiple times a day! 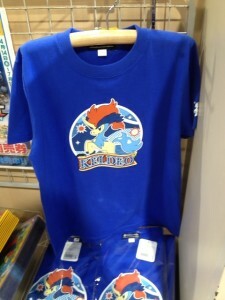 If you need a Pokémon merchandise fix, Pokémon Tokyo is all you need. Granted, it would be nice if they wrote a little bit about all of the different items they post pictures of, but the titles are generally more than enough to figure out what the picture’s of, even if you don’t speak Japanese. I suppose actually writing about each thing would take away from the time they could be posting more photos, so I won’t hold it against them. I don’t really wear too many t-shirts, but I quite like the design of this one! 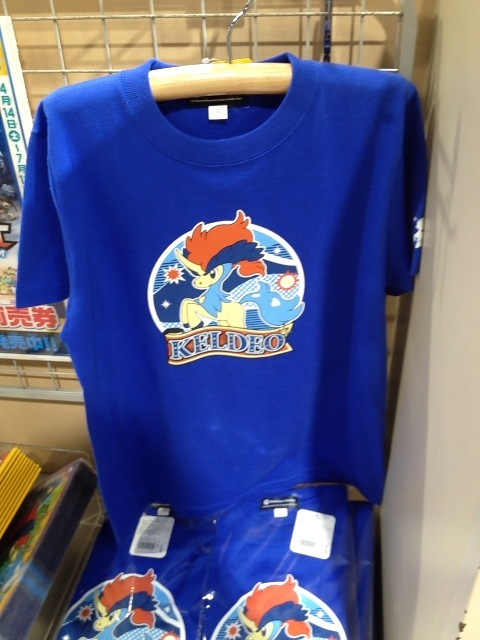 I would totally wear it, even though I never thought myself much of a Keldeo fan. Classy handkerchiefs! Love the retro pixel art. But I am quite partial to grass Pokémon (don’t ask why, I have no idea), so perhaps this one? Oh, but the water Pokémon-themed design is so cute, too… Can I just have them all? Okay, admittedly that wasn’t as mind-blowing as I hoped it would be, but it’s still pretty darn adorable. I give you: the Stunfisk section. 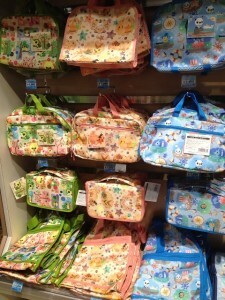 Is there some kind of hidden love for Stunfisk in Japan that I’m not aware of? I always thought of him to be some kind of sad Pokémon joke, kind of like Luvdisc (granted, Luvdisc is much, much worse). Anyway, I’m glad to see so much merchandise for this under-appreciated (?) Pokémon! I know Japan is famous for their superbly weird merchandise, but I never thought the day would come when I’d be writing about an anime/razor crossover… Yup, you read that right. 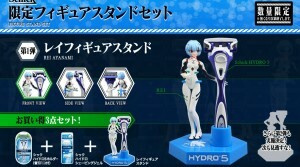 The razor company Schick has teamed up with hit sci-fi anime Evangelion in preparation for the upcoming remake film Evangelion 3.0: You Can (Not) Redo (which isn’t coming out until fall, funnily enough), and will be releasing all manner of crazy tie-in razors. 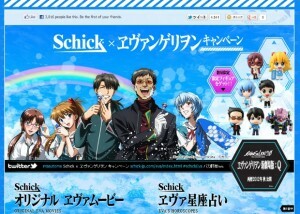 Who knew Gendo found shaving so delightful? 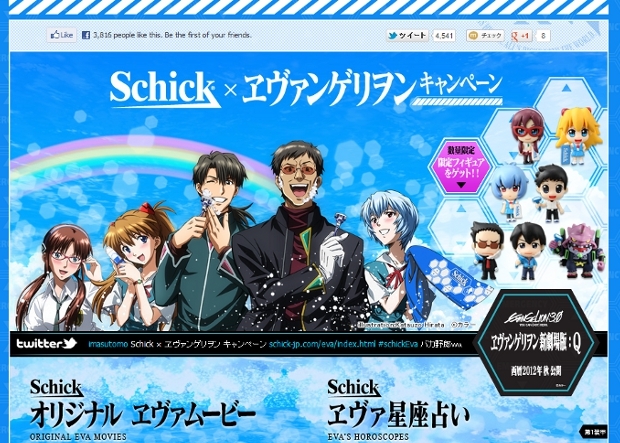 I’m not sure if someone in Schick went off the deep end or had a stroke of genius… I’m actually leaning towards the latter, ’cause I’m seriously starting to think I wouldn’t mind one of those keychains! If you’re finding yourself oddly intrigued by the campaign, you can view the official website here. Of course, as always, this is a Japan-only promotion.